Ignore the message about NetworkManager(we want this disabled) as we would switch to "Traditional(Wicked)" method from the first tab. 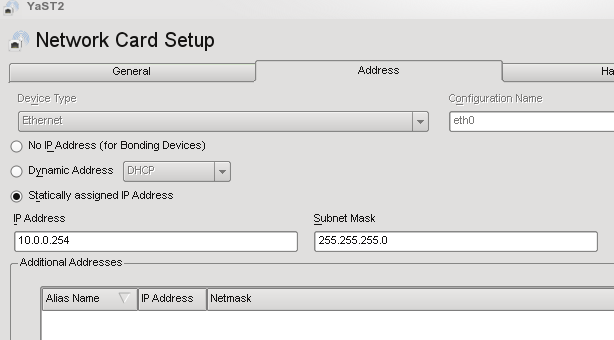 Assign static IP address to the internal interface(delete the default bridged interface br0, and use ethX directly): IP address 10.0.0.254, Mask 255.255.255.0 as shown in the image below. LTSP is concerned with interface connected to internal network only. Note: If you wish to use br0, then make sure it is removed from firewall external zone and added to internal zone along with the physical interface, e.g. if eth0 is assigned to br0 then it too must be removed from external zone and added to internal zone, use yast2 firewall or edit /etc/sysconfig/SuSEfirewall2 to make this change. This is the interface through which LTSP clients will connect to the server. You may have one or more than one network interfaces on the server. The interface connected to the internet should be in "External Zone" of the firewall. The one which will serve as LTSP interface should be in "Internal Zone" of the firewall. Change the firewall settings accordingly. Make sure there is no other running DHCP server in the network. Check that the interface is enabled to start at boot time and assigned to firewall internal zone. Following two additional steps are required to get internet working in localapps if you are not using a proxy server. Enable "IP Forwarding" from the Routing tab in yast2 lan module. Enable "Masquerading" from yast2 firewall. 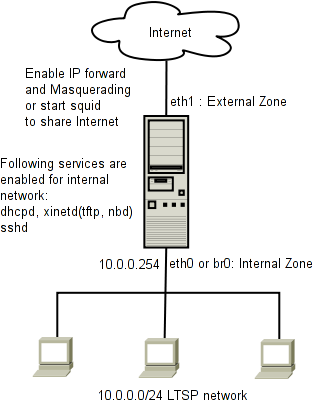 Make sure you have a two NIC setup with one in "External" (Going to the Internet), and another in "Internal" (Going to LTSP Local Network), firewall zone for this to work. Alternatively you can run a proxy server, you may need to install squid packages if you are not running openSUSE Edu Li-f-e DVD. Configure localapp firefox to use that proxy, it requires IP address of the server and port 3128(default) to be specified. If the internet still does not work see the Troubleshooting page. This page was last modified on 3 December 2015, at 13:56.